If you are a CFO or a finance manager who is about to purchase and implement a new reporting and budgeting software, this article is for you. What you and many others don´t realize is that successfully choosing a reporting and budgeting software that fits your needs and negotiating its price to an acceptable price range is half the battle. The real (and bloody) battle is in the implementation of your chosen software. If this is the first time you are upgrading, there are a few issues you should be aware of before you begin. If you have done a previous upgrade, you probably already know that there will always be hiccups in the process. 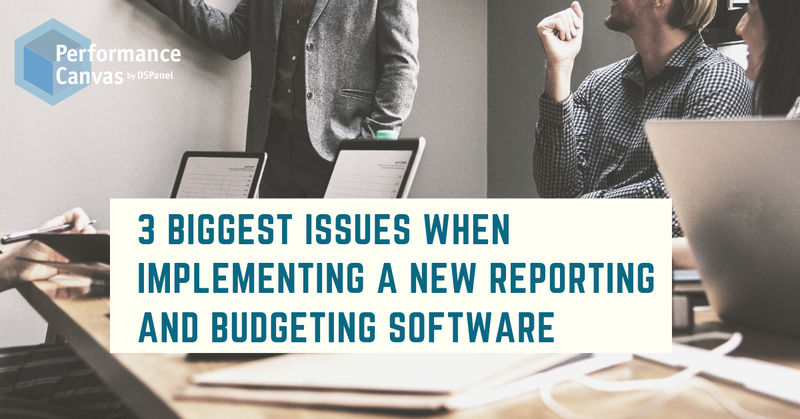 Now, these issues transcend products – whatever brand of reporting and budgeting software you choose, the three issues below apply. According to one of our senior consultants, many finance departments do not realize just how many arbitrary rules they have when they are reporting and budgeting. Especially for those used to working in MS Excel, they don´t think so much about the number of exceptions they make when it has become a habit. They also don´t realize that adding a few cells here and there add up and make the entire process somehow disorganized. The finance managers, CFOs, and their teams do not realize that it takes a lot of skill, time, and effort to move from working in an unstructured/semi-structured way to working in a very structured manner. You need to think about how you want to work moving forward, what type of exceptions you will allow or how to best standardize and optimize tasks. All these require constant decision-making during the implementation which can contribute to the delay in implementation or adding several layers of complexity during the deployment. If you are a CFO who is currently negotiating a deal for purchasing and implementing a new reporting and budgeting software, it is important that you try to be as clear about what you expect as possible and have it documented. Now, the reality is that you cannot be too detailed either because until you and the consultants have finished business or project scoping, it is hard to say with certainty what can be accomplished in these types of deployments. The best you can do is to demand a sales contract with the terms you have agreed upon such as will this include an ERP integration and for what ERP system? Is there supposed to be any other data source linked to the system? How many users did you buy? You should then create a project management document after project scoping mentioning what you expect to be delivered, when, and the gauge for success for each deliverable. This way, both you and the vendor will have a written document to go back to in case there are disputes during implementation. Another common and big issue during implementation is that 1.) you, as a CFO/finance manager, are usually a bit too optimistic about the involvement and availability of your team to support the implementation and 2.) the vendors usually are conservative in their consulting estimates to try to make it appear cheaper than it actually is. Now, unless you agree on a predetermined number of hours for a fixed rate during the entire implemention, knowing exactly how many consulting hours it will take before deployment is completed can be complicated. You should know that demanding a predetermined number of hours for the entire implementation is usually more expensive since the consultants will require a decent margin so that it is still a financially sensible project for them. On the other hand, this is the best way to not go over budget. For most companies, however, they usually do an open consulting hours kind of deal where they demand time and material costs, and when there is a need for more work to be done, they order as needed. This type of arrangement is a more practical and standard approach for implementation, but you must also budget extra hours more than what you think it will take because there are always problems that will pop up along the way. If you are still looking for a capable and affordable cloud reporting and budgeting solution, consider Performance Canvas Financials. It is a complete and cloud-based financial planning and analysis software that will not only streamline your entire process; it will also automate your tasks. This reporting and budgeting software offers leading global best practices in FP&A incorporated as features in the solution to allow you to optimize your budget process. Performance Canvas Financials promises that you will close your books faster and more accurately if you use it and you will be boardroom ready in just 15 minutes. Try out this cloud software for 30 days or see a demo of the product by emailing info@dspanel.com. DSPanel offers cutting edge technology platform for business analytics, planning, and visualization. DSPanel designs, builds, and operates with the end users in mind. Performance Canvas was created by DSPanel to answer the unarticulated needs of the market not addressed by previous available solutions. With Performance Canvas, information is transformed into valuable business insights for the business executives to utilize in their decision-making process. DSPanel currently has over 2500 organizations deploying their solutions. DSPanel is a market leading provider of complete Corporate Performance Management solutions. DSPanel has worked with leading Fortune500 companies providing them with an integrated business intelligence and CPM solution. We are committed to providing BI and CPM solution to the masses. Our solutions are based on the needs, time, and monetary constraints that business people face every day.